Sutton Coldfield did not escape the Europe-wide catastrophes of the fourteenth century - the great famine of 1322 with widespread starvation, the epidemic known as the Black Death of 1348-9 which killed half the population, and the so-called children’s plague of 1362. In 1320 the estimated population of Sutton was fifteen hundred, but only five hundred in 1380. The feudal system adapted easily to the changed circumstances after the Black Death - after all, the population of Sutton in 1086 had been no higher than five hundred - and the land continued to be farmed , the lord continued to collect entry fines and heriots, and the courts levied penalty fines for misdemeanours. The markets and fairs continued to function in spite of the reduced number of consumers, prices remained stable, and wages improved slightly as there were fewer workmen. More land was laid to pasture, more animals were kept, and meat, which had been a rare treat in 1320, was now a regular part of the peasant diet. The half-yearly Court Leet in Sutton continued to function - the participants were twelve jurymen, ten ale-tasters, ten tithingmen and the constable elected from the householders, the Bailiff representing the lord’s interest in the manor and the Chase Rider or other foresters representing his interest in Sutton Chase - presided over by the lord’s steward. Court records of 1416 show that the peasants were more free than before, all paying a money rent for their holdings; peasants had more freedom of movement, with newcomers being sworn in to the manor and others recorded as leaving the manor. The court dealt with the death of tenants by finding out who was the heir. After the Black Death the next heir might be quite distant kin who already held sufficient land, so a market for buying and selling property developed, under the watchful eye of the bailiff. Most farms still consisted of thirty or forty selions or strips of land in the various open fields, but some tenants managed to accumulate larger, consolidated holdings of more than fifty acres. The Earl of Warwick’s income from the manor in the fifteenth century was about £48, compared with £24 in 1326, the increase due to payment of rent in money rather than services. Richard Beauchamp, Earl of Warwick, still benefitted from the sport and venison to be had at Sutton, but if he was supported by Sutton Bowmen at the famous Battle of Agincourt in 1415, they were there as paid soldiers rather than the feudal bondsmen who took part with his ancestor in the Battle of Crecy in 1346, before the Black Death. 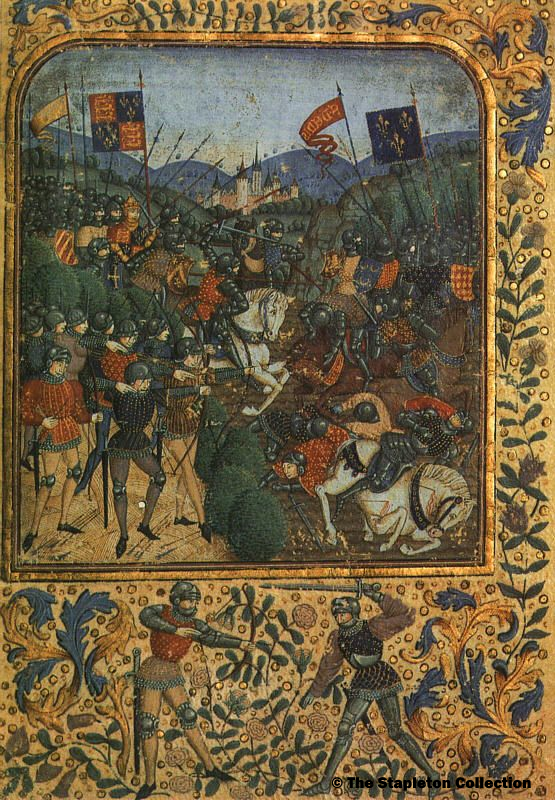 Bowmen at the Battle of Agincourt (1415);the Earl of Warwick was there with bowmen from his manors (including Sutton) in his retinue.